Deciding on an appropriate application delivery controller (ADC) and evaluating the need for supporting infrastructure is a complex, complicated, and challenging job. Such challenges result from the fact that ADCs are increasingly used across diverse environments and virtual, cloud, and physical appliances. The following is a Q&A with Ron Winward. Ron is a Security Evangelist for Radware, where he helps execute the company’s thought leadership on today’s security threat landscape. Ron brings nearly 20 years of experience in the internet service provider space, most recently as Director of Network Engineering for a global infrastructure and colocation provider. With an expertise in network architectures and DDoS mitigation, Ron has helped design solutions for carriers, enterprises, and cyber security service providers around the world. Behind every new hack or data breach, there’s a company scrambling to put out the fire. That’s good news for cyber security professionals with the right skills. 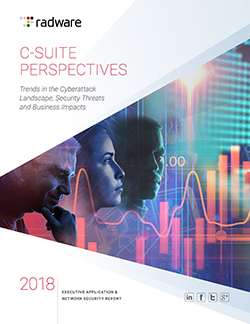 However, between shortages in qualified security professionals, evolving attack vectors, and new DDoS mitigation capabilities and deployment models, organizations looking to safeguard themselves can be left in a difficult position when it comes to finding the best talent, whether it be in-house or outsourced.